Arguably, the strides made in psychedelic research and the push towards legal psychedelic medicine over the past 50 years (and especially during the past 15 years) can be considered some of the greatest paradigmatic shifts of our time. For example, just in my short lifetime, I have witnessed cannabis transition from an absolutely illegal substance, to a fully legal recreational commodity in states like Colorado (even though it still sits on the DEA Schedule 1 narcotic list). I have even offered my services as a volunteer in the MAPS (The Multidisciplinary Association for Psychedelic Studies) phase 2 clinical trials for MDMA psychotherapy, where I stayed overnight in the office/treatment center supervising participant who had completed the study. The contributions of thousands of people working on the front lines of the psychedelic renaissance have been incredible and far-reaching. 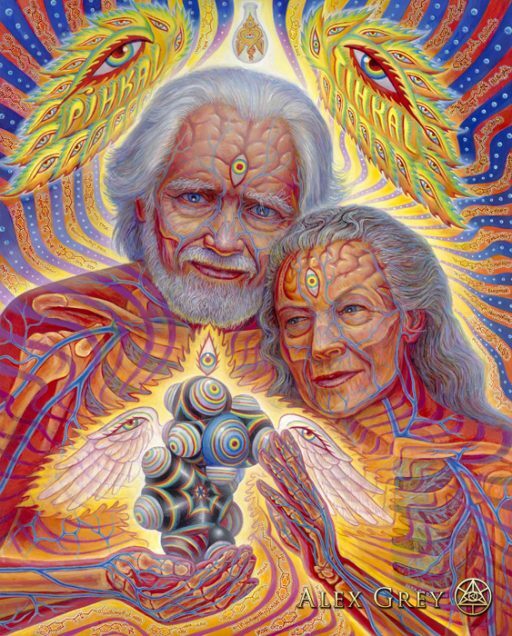 There are so many stories that could be shared, and in this article I want to take a moment to highlight the work of Dr. Alexander Shulgin, who recently passed away (and who is featured in the Alex Grey cover art along with his wife and long-term co-contributor Ann Shulgin), as well as Dr. Rick Strassman (the “Godfather” of psychedelic research and author of DMT: The Spirit Molecule), and Dr. Rick Doblin (founder of MAPS), both of whom I have had the pleasure of interviewing on Lucid Planet Radio. Examining the stories of these heavyweights can teach us some worthwhile lessons about what it takes to shift a paradigm in one generation. The year is 1976 and Dr. Alexander ‘Sasha’ Shulgin sits in deep thought at his work desk in his backyard laboratory at “the farm.” He has just synthesized the compound MDMA (chemical name: 3,4 methylenedioxy N-methylamphetamine or methylene-dioxy-meth-amphetamine), originally invented by the Germans around the turn of the 20th century, patented by MERCK, and left on a shelf to collect dust for over half a century. Could he have known that this white crystalline solid, the hydrocloride salt of an amine, would go on to fundamentally alter human consciousness and relationships? Dr. Shulgin spent most of his professional adult life doing exactly this: synthesizing chemical compounds. As a biochemist and pharmacologist, he worked for nearly two decades as a highly successful senior research chemist at Dow Pharmaceuticals until he ‘retired’ to set up his home laboratory nicknamed ‘the farm’ in the mid 1960’s. Of primary interest to Dr. Shulgin was the creation of tools that could enhance and expand consciousness, and he is credited as the developer of a multitude of new psychedelic substances including the 2C family of phenethylamines. After becoming such a successful and well-respected chemist at Dow, all of his psychedelic research at ‘the farm’ was conducted with permission from the DEA under a Schedule 1 license. After Dr. Shulgin introduced the compound to his psychotherapist friend Dr. Leo Zeff, MDMA spread like wildfire to hundreds of psychologists and lay-therapists across the nation as a tool that could increase openness, honesty and empathy in therapeutic settings. Shulgin’s decision to synthesize MDMA, which was allegedly suggested by a student at the medical chemistry group he advised at San Francisco State University, had a lasting effect upon the lives of millions of people, and substantially augmented the experience of consciousness as we know it. Did Sasha know his work would have such a lasting impact on the world? Or was he simply following his passion and doing what he had been trained to do? It is easy to feel so powerless and small against the vastness of the changes that need to happen for human life to remain sustainable. Can one person really make a difference? The life and work of Dr. Shulgin and others in the psychedelic renaissance teaches us, that YES! One person can make an impact greater than they could ever imagine. Millions of people have used MDMA to experience the healing, empathetic, heart-opening effects it offers. Dr. Shulgin not only created and/or synthesized numerous chemical compounds designed as tools to help us expand and explore our consciousness, but he also self-published PIKHAL (1991) and TIKHAL (1997) with his wife Ann Shulgin, which are manuals about his scientific process that include detailed biochemical instructions, insights and his Shulgin Rating Scale. He personally tested hundreds of chemical compounds, mainly analogues of various phenethylamines and tryptamines. The publishing of these books led to the DEA revoking Dr. Shulgin’s Schedule 1 license to experiment with psychedelic compounds, but after a lifetime of working within the system and learning everything he could, the knowledge that Dr. Shulgin shared with the world was invaluable. Despite the best efforts of the ‘war on drugs’ of the 1980’s and 1990’s, MDMA is now being used in numerous clinical studies for PTSD, and MAPS is working on launching Phase 3 FDA clinical trials to make it a legal, prescription medicine by 2021. MDMA has been hailed as the ‘miracle love drug,’ and ‘penicillin for the soul’, and many psychedelic compounds (such as LSD, Psilocybin and particularly Ketamine) are being touted as ‘miracles for modern psychiatry.’ Yet Dr. Shulgin never applied labels and is often credited for saying that “no drug is inherently good or inherently bad.” His focus was on creating TOOLS that people could use in their process to expand their consciousness, heal their souls, and explore alternative realms. For more on Dr. Shulgin’s research and legacy, watch The Love Drug: I Am Rebel on National Geographic. Many people know Dr. Rick Strassman as the ‘Godfather’ of modern psychedelic research in the US, and as the scientist who touched millions of lives with his book and the documentary film based upon his research, “DMT: The Spirit Molecule.” Dr. Strassman was the first scientist of the modern era to receive permission to conduct psychedelic research from the Federal Government, for his 1990 study of DMT’s effects in humans. Dimethyltryptamine is incredibly common in nature, and known to be produced in small doses in many plants, as well as across several animal species including humans. Users report being transported to alternative dimensions, experiencing profound visionary/ religious states and having detailed interactions with beings or ‘DMT entities.’ Some users say that DMT offers the ultimate religious experience. Since it entered the mainstream, DMT has spawned a cultural movement of art, music and storytelling detailed brilliantly in anthropologist Graham St. John’s new book, Mystery School in Hyperspace. DMT had been given safely to humans in the 1950’s and 60’s with no evidence of neurotoxicity or other major prolonged adverse effects. Extensive studies in animals had not demonstrated any major toxic effects, unlike MDMA which at the time was thought to be neurotoxic in animals. The study itself was purely psychopharmacological – It was descriptive, involving volunteers as opposed to patients, and designed to characterize the effects of DMT rather than conduct therapy or induce mystical experience. These short, medically supervised bursts of DMT experience often lasted only 10 minutes for participants (but sometimes felt like lifetimes). Finally, Dr. Strassman had an excellent track record as a clinical research scientist. His training was extensive and he had been awarded grants and published papers, showing his capacity for human subjects research. This combination of factors seemed to come together perfectly, at the right place at the right time. Indeed, Dr. Strassman began thinking about doing psychedelic drug research when he was 20, in 1972. He went to medical school and underwent psychiatric training, extra research training, and conducted preliminary Pineal gland studies with melatonin, all with the long term plan of doing psychedelic research. He began his process with an idea in 1972, and administered his first dose of DMT in 1990! Now THAT is what we call commitment, people! In addition to DMT: The Spirit Molecule, Dr. Strassman has several other books including his newest, “DMT and The Soul of Prophecy” (2014) available now on Amazon. One person who has definitely NOT kept his cards close to his chest is Dr. Rick Doblin, the founder and director of MAPS (The Multidisciplinary Association of Psychedelic Studies) and one of the most outspoken proponents for psychedelic medicine over the last 25 years. What makes Doblin’s work so audacious (and unique) was his willingness to work from within the system to legalize psychedelics. After first trying LSD in 1972, his life embarked on an unbreakable trajectory. Perhaps it is more than coincidence that this was also the same year that Dr. Strassman began to consider the impact of psychedelic drugs in the brain. It may require a lot of chutzpah to take on multiple branches of the American government, but Rick explains in our interview that he absolutely loves America and is grateful to have the opportunity to present his dissenting viewpoint. For example, MAPS has been very involved in LSD research and Doblin even became close friends with Dr. Albert Hoffman, the Swiss inventor of LSD. Before he passed away at age 102, Hoffman asked Doblin to have his pivotal work LSD: My Problem Child translated into Chinese and Russian, to help educate people in those countries who had missed out on the psychedelic revolution in the US. Unfortunately, there are laws in these countries against speaking positively about illegal drugs, and therefore the book was banned both in print and online. Doblin explained in our interview how he was exposed to MDMA in the early 1980’s while it was still legal, after being introduced to a whole network of psychiatrists and psychologists who were using it with their patients in a quiet way. During this time, MDMA was already being sold as ‘ecstasy’, but due to the escalation of the drug war it was made illegal in 1985. A friend of Doblin’s had a non-profit organization that was affiliated with Buckminster Fuller which was not being used, and they were able to take it over to use it to coordinate their efforts to sue the DEA. Since then, MAPS has conducted several large scale clinical trials on the benefits of MDMA psychotherapy for female survivors of sexual assault as well as for veterans, firefighters and police officers with PTSD (more on studies here). These studies have shown that after 3 MDMA sessions, over 80% of participants no longer had PTSD. Results like this are almost unheard of in psychiatry and psychotherapy, and the path towards legalization looks promising as MAPS moves forward into Phase 3 FDA clinical trials in 2017. Doblin tells me that MAPS was recently highlighted at the American Psychiatric Association meeting, with a three hour panel on psychedelic medicine that was very well attended. MAPS and its affiliates are currently conducting studies on MDMA for autistic adults with social anxiety, people with life-threatening illnesses, and cognitive-behavioral conjoint therapy for couples where one member has PTSD. They are also working on a host of studies on other psychedelic compounds including LSD, Psilocybin, cannabis and more. While proponents of psychedelic medicine have traditionally viewed law enforcement and the DEA as their ‘enemy,’ Doblin is quick to remind me that a senior retired DEA official is a regular consultant with MAPS, and that police officers and firefighters have also volunteered to participate in MDMA psychotherapy research to help heal their PTSD. The take home message from Dr. Rick Doblin is one of FREEDOM and UNITY: People tend to marginalize themselves as ‘counter-culture,’ but MAPS is all about creating a “New Mainstream” by transforming the counter-culture of the 60’s and propelling it into the mainstream culture of the 21st century. Psychedelic medicine is rallying people together to ease their suffering, regardless of their backstory, religion, political views, ethnicity, etc. Doblin says that “if the time is right and the suffering is great enough, people will overcome their resistances.” Indeed, with the success of MAPS’ studies, we are well on our way. Rick Doblin also reminded me that society has changed so much since psychedelics first erupted into our culture 50 years ago. While the counter-culture movement of the 1960’s had very few elders, today we are being guided by those who have lived through the movement and who have learned from it. For example, thousands of aspiring new biochemists have grown up reading Pikhal and Tikhal and are seeking to continue Dr. Shulgin’s legacy. Whereas before we lived in a traumatized, paranoid post WWII society, today we DO have increasingly progressive attitudes about birth and death, along with millions of people integrating yoga, eastern meditation and alternative health practices into their lives. The aging baby boomers who may have once experimented with psychedelics when they were young are beginning to return to these familiar and once-useful tools as they face the struggles of retirement, illness and death. There is more psychedelic research being conducted now than at any time in the past 45 years. The resistance and fear of these substances is declining as research is showing that in therapeutic settings, these medicines can relieve suffering with very few negative consequences. As a psychologist, author and creative person, I feel so inspired and grateful to hear these stories of visionaries who have worked so tirelessly to shift this paradigm- All by heeding the call of their passion and staying focused on the work that they were called to do. In this ‘fast food society‘ that emphasizes immediacy and shortcuts over perseverance and hard-work, it is important to keep in perspective that the impact you have upon the world may be measured in the long term, and can be larger than you could ever imagine. The future is not a fixed point, and as paradigms begin to shift, keep in mind that your work and your contribution is not only important, but VITAL. Your impact and ‘success’ can come in many different ways, on various timelines, and often through unexpected channels. Remember, Dr. Alexander Shulgin was retired and in his 70’s when he made his breakthroughs with MDMA. Dr. Rick Strassman spent nearly 20 years on his path to fulfill his goals of conducting psychedelic research. Dr. Rick Doblin worked for over 20 years before MDMA psychotherapy was approved by the FDA. My take home message? Even in times of struggle and when change seems impossible.. Don’t give up! It is NEVER too late, unless you believe it is. With Blessings and Love, Dr. Kelly – August 1st, 2016. Artwork by: Alex Grey, “The Shulgins and Their Alchemical Angels” 2010.